Review copy received from the publisher via NetGalley, thank you! Burton Book Review Rating: 4.5 stars, enjoyed the story very much! Lady Anne Stone believes her prayers are answered and she’s at last found her long lost uncle. Unwilling to let her meet him on her own, Daniel Adams accompanies her to her uncle’s ranch. But instead of answers, Anne is left with more questions. Both Dan and Anne are convinced the man introduced as her uncle is an impostor and decide to continue the search for the new Earl of Stoneford. But now the swindler is on their trail, hoping to steal Uncle David’s inheritance. Dan has his hands full trying to protect Anne, but he finds he must guard his heart just as carefully. Even though he’s good at keeping her safe, he knows he’ll never convince Anne to become a farmer’s wife in Oregon when she has her sights set on returning to her home in England. But as Anne’s quest becomes even more difficult — and dangerous — Anne begins to see Dan differently. Will she soon be envisioning a new life in America? 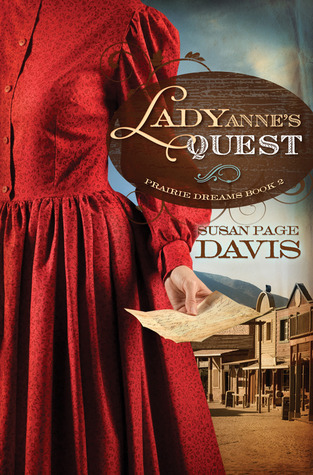 This is the second book in Susan Page Davis' Prairie Dreams series, which I was unaware of until I started reading it. However, not reading the first book, The Lady's Maid, did not cause confusion with this novel. It seems the first novel followed more closely the story of Elise, the maid to Lady Anne, as they traveled to Oregon via wagon trail in search for Uncle David. This second installment picks up the story where the first left off, this time focusing on the story of Lady Anne and her ongoing search for Uncle David. During the journey, Anne is accompanied by loyal friend and admirer Dan Adams, who protects and leads her as Anne gets closer to finding the elusive Uncle David. It's circa 1855, and a simple phone call just isn't possible to let Uncle David know that he is the new Earl of Stoneford back in England. Lady Anne is on Uncle David's trail, but she is impeded by impostors and reprehensible characters along the way. And it turns out that a murderer from the first book is also on Lady Anne's trail again. They come across some helpful folks to help them find the real Uncle David, until disaster occurs and the given trust proves unwarranted. There are several intriguing characters in Lady Anne's Quest, including Millie and Sam being the two scoundrels that seek to hinder the journey of Lady Anne. Millie reaches Uncle David first, and the consequences of that meeting threaten everything that Lady Anne has worked for. Behind the scenes is Anne's fellow traveler, Dan, who we know loves Anne sincerely and deeply. The romance portion of the novel is very discreet and unnoticeable, as the key to this story is the search for Uncle David. With all the plot twists, it reads more like a mystery, with very gentle undertones of the Christian fiction theme. 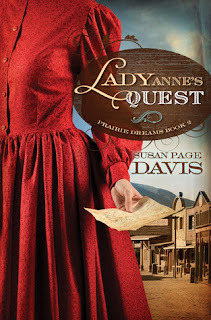 Lady Anne's Quest was a page-turner embracing the historical setting of the Oregon trail and the quaint hotels along the way. Very well-written, I would recommend Lady Anne's Quest for readers of historical fiction who would enjoy its Western theme. If I could do it over again, I would read The Lady's Maid first. Chronological events are evident in book two that would probably hinder my ability of enjoying of the first book after the second. But, I will definitely look up the rest of the novels that are written by Susan Page Davis to see what others to add to my to-be-read pile. And I will be reading book number three, A Lady in the Making (October 2012), which finally follows more of Uncle David's character.